In England church bells have been rung since the 7th century but it was not until the mid 17th century that change ringing was introduced. Church bells have been rung to summon parishioners to services; to celebrate weddings; and to mark local and national occasions. On 23 August 1637 the spire of St Mary’s Church was destroyed when it was struck by lightning and the fierce heat melted the five bells hanging there. In 1639 funds were to be raised to rebuild the tower and spire. However, the sums asked of parishioners by way of a parish tax were beyond their ability to pay and only £2,745 was raised. This was insufficient to rebuild the tower to its original height and so a lower tower with a crenelated top was constructed. Just one bell was hung in the single turret in 1640. Between 1640 and 1690 a second bell was hung and then, in 1690, Edward Bathhurst of Finchcocks gifted a third bell. 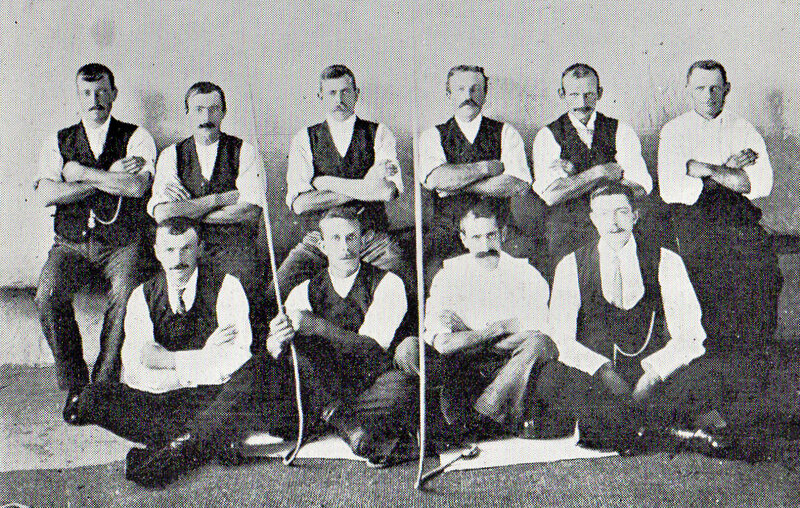 A few years later, in 1697, John Bathhurst of Trillinghurst gifted a fourth. Richard Phelps recast the latter two bells in 1707. Thomas Mears again recast the fourth bell in 1805. Both bells still bear an inscription showing their original donors’ names. At the same time Richard Phelps cast four more bells, two to replace the first bells and two additional bells making the total number six. An inscription on one of the Phelps bells reads, “RICHARD PHELPS MADE THESE SIX BELLS ANNO DOMINI 1707 ANNA REGINA”. In 1775 funds were raised and Pack and Chapman cast two new treble bells to hang in the tower, bringing the number of bells to eight, as it is today. It is thought that the village inn, The Eight Bells, was named in celebration of the church bells and that the landlord was himself a bellringer. Finally, the second bell and the tenor bell (the Great Bell) were recast by Thomas Mears in 1834. The heaviest bell, the tenor, is in D and has a weight of 23¾ cwt. 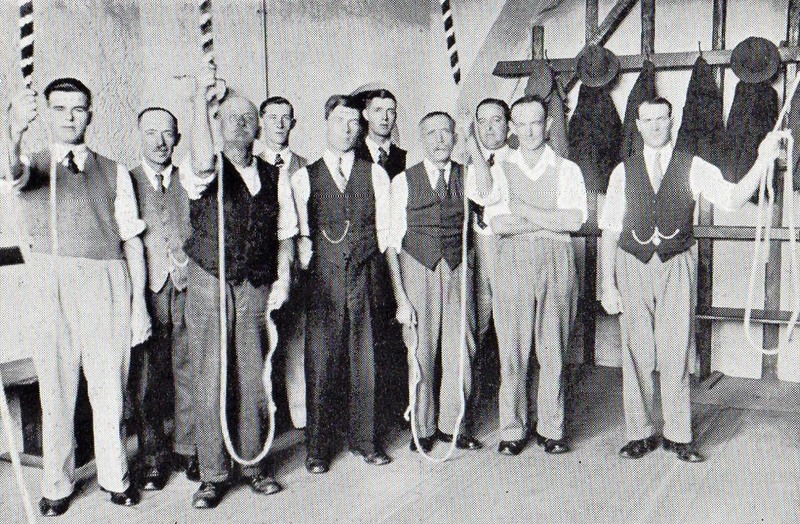 Bellringers haven’t always had the best of reputations over the centuries until the Victorian period when rules governing behavior started to be set. Although we have no evidence of the situation in Goudhurst, bellringers were widely reputed to be attracted by the money paid to them for their services which they then very quickly spent in their local inns! One incident that occurred in 1858 caused quite a stir. At 4 o’clock on the morning of 2nd June, nine men broke into the belfry of St Mary’s Church and started to ring the bells to the annoyance and disturbance of the inhabitants. Apparently the ringing of the bells was in a ‘noisy, disorderly, and turbulent manner’ and continued for some three hours! The result was that complaints were laid before a Justice of the Peace against all nine men and they were ordered to appear before the Justices in Cranbrook on 30th June 1858. Unfortunately we do not know whether any of the men were bellringers attached to St Mary’s Church or whether the prosecution was pursued. By the 1920s the bellringers in Goudhurst appear to have been in good favour with the vicar as, in the Parish magazine for February 1922, it was reported that “The vicar, as in other years, entertained the bellringers to supper on New Year’s Eve…..the supper was given at the Coffee Tavern, where a very hearty meal of roast beef and plum pudding was supplied and thoroughly enjoyed”. However, relationships might have soured soon after when the bellringers went on strike: previously they had relied on the goodwill of parishioners for their income whereas bellringers in other parishes received a fixed annual wage. By early 1923, the situation had been resolved and the bells were once again ringing. The church bells have always been part of celebrations in Goudhurst, not only for weddings but also for national events. On 22nd June 1911 the church bells were rung at intervals throughout the day, starting at 5am to mark the coronation of King George V. On May 6th 1935 the bells rang out once again from 7am to mark his Silver Jubilee. John William Southon, Frank Thomas Parnell, Frank Osborne and Percy Harrison. The ‘Goudhurst Ringers’ were very much an integral part of the celebrations ringing the church bells at 7am and at various times throughout the day. They broke for an enjoyable lunch at The Vine! The bells were silenced during the Second World War but the tradition of ringing the bells for coronations was resumed for that of the present Queen in 1953, when the bells were rung from 8am. On June 7th 1977 the bells rang out again, from 7am, and at various times throughout the day, in celebration of Queen Elizabeth ll’s Silver Jubilee. Eli Samuel Brackfield was a bellringer from the age of 17 years in 1880. He was still ringing the bells in 1937. He died in 1943. 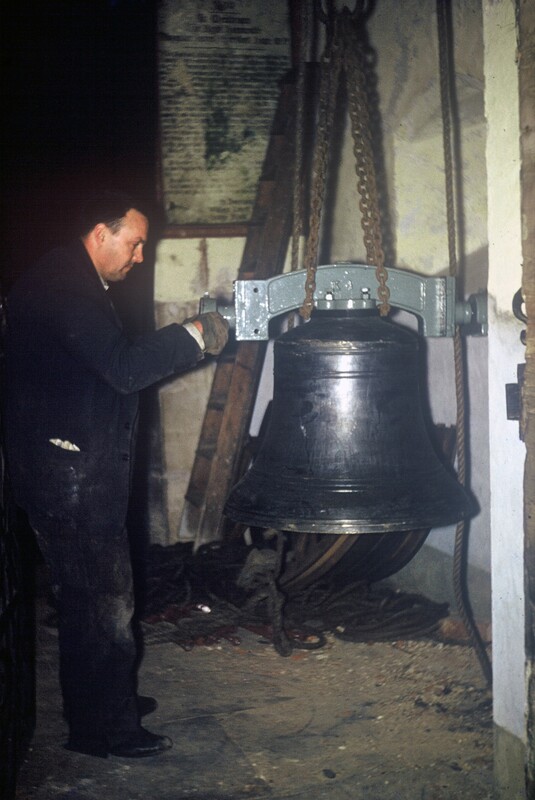 George Haylor rang the bells for 63 years, retiring in 1961. In 1958 a supper was held to celebrate his 60 years of bellringing when Frank Bond, as Captain, paid tribute to his long record of service. The supper was mentioned by the BBC local news on 12th November 1958. George died in 1964. Jack Southon was a bellringer for 50 years, as well as being a sidesman and a verger for part of that time. He had been awarded the Coronation Medal for his services to the Fire Brigade and the Red Cross, and was a special constable for 40 years too. Jack died in 1966, a great loss to the village. 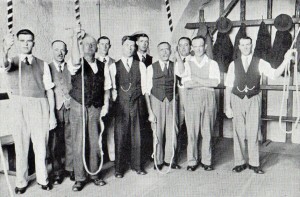 Frank Bond joined the bellringers in February 1923. In 1992, at the age of 90, he had clocked up 70 years of ringing. During that time he had been secretary and then captain of the team. In an article in the Kent & Sussex Courier, in September 1992, Frank recalled the days when he had to get up at 5.30am to ring the bells on Christmas morning. It was Frank’s wish that he would pass away in the belfry but that wasn’t to be. He died a little over one year later in November 1993. Construction of Christ Church, Kilndown started in 1839 and the church was consecrated in 1841. In 1844 six bells were cast by Charles and George Mears of London. In 1908 Mears and Stainbank of London recast the tenor bell. It was thought that the bells were too heavy for the tower and so, in 1957, the bells were recast at a lighter weight by Mears and Stainbank and re-hung in the tower the following year. In 1975 the bells were removed while the tower and spire were re-pointed. 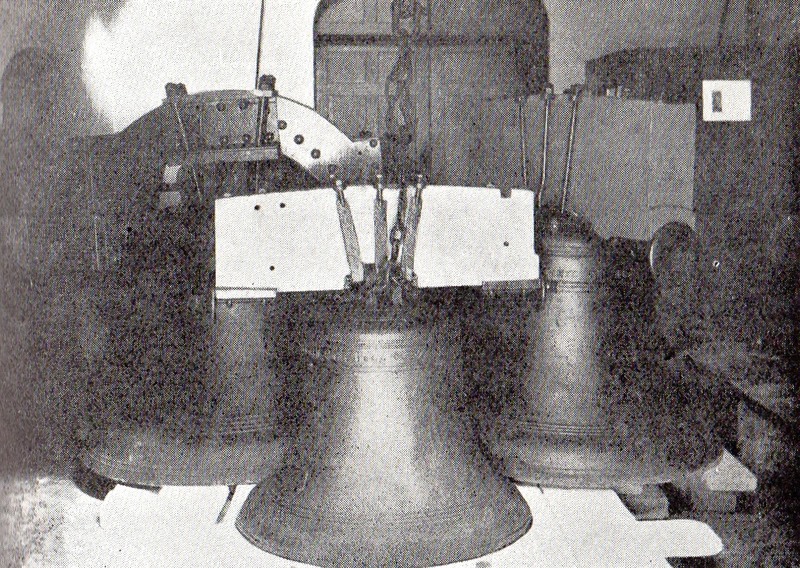 On completion of the work the bells were re-hung. The heaviest bell, the tenor, is in A and weighs 9cwt. According to the minutes of the meetings held by the Christ Church bellringers in 1892, the names of the ringers for that year were:- H J Stanbridge (Captain & Treasurer); G Henley (Secretary); T Pattenden; J Fishenden; W Aylard; L Barrow; J Barrow; and F Bellingham (Probationer). At a later meeting “… it was proposed to ring on Thursday, July 6th, 1893, in honour of the Royal Wedding, agreeable to ring proposed by H Stanbridge. To ring from seven to half-past eight settled.” This referred to the wedding of the Duke of York (later King George V) to Princess Mary of Teck. The bells were rung at 9.30 in the morning of 6th May 1935 to commence the celebrations for King George V’s Silver Jubilee. The bellringers in that year were:- F Pattenden; B Relf; G Waghorn; F Foreman; W Dengate Snr; H Dengate; and W Dengate Jnr. On 12th May 1937 the bells were again rung from 9.30 am to mark the coronation of King George Vl and Queen Elizabeth. More recently, the bells rang out on the morning of Sunday June 5th 1977, when a service of thanksgiving was held in Christ Church to mark the Silver Jubilee of Queen Elizabeth ll.